Well Bobby the brakes fit pretty good! I stuck one of these wheels on just to see that it will work ok. It will be coming off again until the body is back on. It appears that it will look nice. Yep, looks good. Did you have any problems installing them? The concentric ring was a bit snug but with cleaning off the bearing hub and slightly filing the ring it went together very nice. I would prefer slightly snug over slightly loose so it was very good. Just went through your entire build thread. Kudos to you for sticking with it - my build thread have been around that long too. That was a long time before that first fire up - congrats as so many projects never get finished. 1. What year Aurora engine? 3. 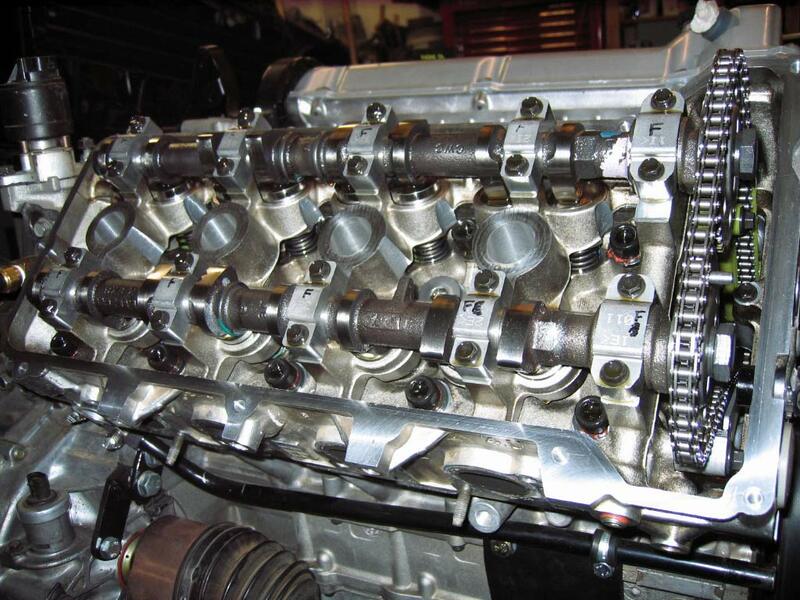 How did you fix (or did you fix) the compression in the #8 cylinder? P.S. The speedo you sent arrived undamaged and looks good - thanks again, plus for you! Hi Ryan, thanks for the Kudo's! It was very rewarding to hear it fire up finally! My Aurora engine turned out to be a warranty pull because of the #8 cylinder. (which is why it has so few miles on it.) I am hoping it is just the valve seals or valve guides. The engine has date stamps on it that show both 95 and 96 so I am going to guess it is a 96. I suppose they could have switched heads attempting to fix the #8 cylinder problem but I doubt they would have bothered. The Holley 950 commander setup is old-school but with a wide band O2 sensor and a laptop I believe it can be used with success. Ryan.hess's 7730 setup would be really nice but I had bought this one before he posted about his method. 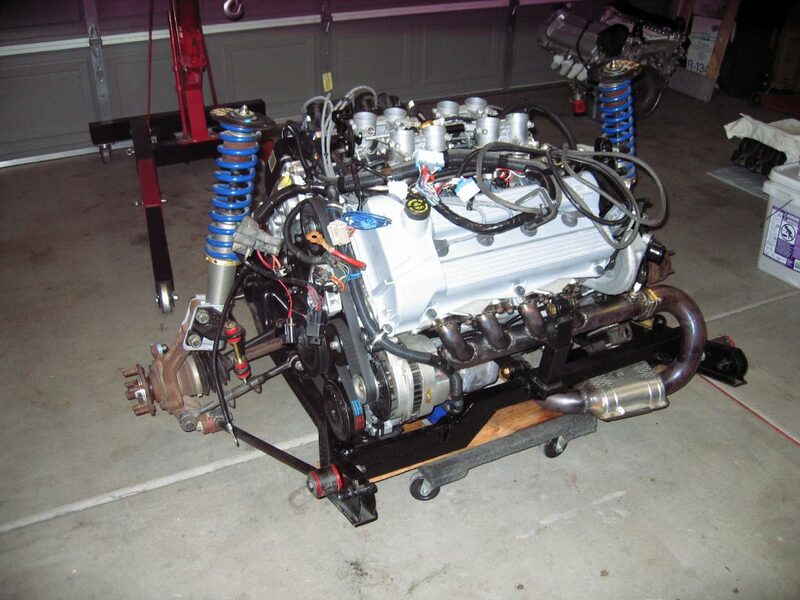 Check out chrfab.com for more info on the Holley and other engine management systems they sell. Allen will take the time to talk to you and give suggestions. PS, + back at cha. Just a bump and some rambling to keep the thread alive. Also, I have been working on the interior. The gauge pod is out along with the dash-pad. I have been installing the wire harnesses for electric windows, locks and mirrors. These harnesses are all donations from the black 86GT (an early model with the coupe body and ribbed molding.) That car had 170,000 plus miles on it so I am curious if the power stuff will work ok or not. I am attempting to clean and grease what I can get to. The modded gauge pod is ready to install along with a different dash-pad that currently has no cracks. (I doubt that will last long once I start driving the car.) While I could get to it easily, I pulled the cover off the heater core box and looked in there for any leaks. There are some stains on the carpet but the area around the heater core looks fine. I guess it probably was from the A/C condensation dripping onto the carpet. I pulled the center skeleton and the shifter to clean in and around there (along with making room for the extra wires.) and what a mess! The P/O was a smoker and it looked like an ashtray in there. 20 years of cola products appear to have been spilled there also. It is clean now and the shifter has been greased so it should be ok now. Just need to do the temp gauge/temp light test mode mod and get all of that back together. I will need to do a little modding to the trim surround that sits in front of the shifter to install the A/F gauge. Then it should be complete. Ok, rambling mode off for now. 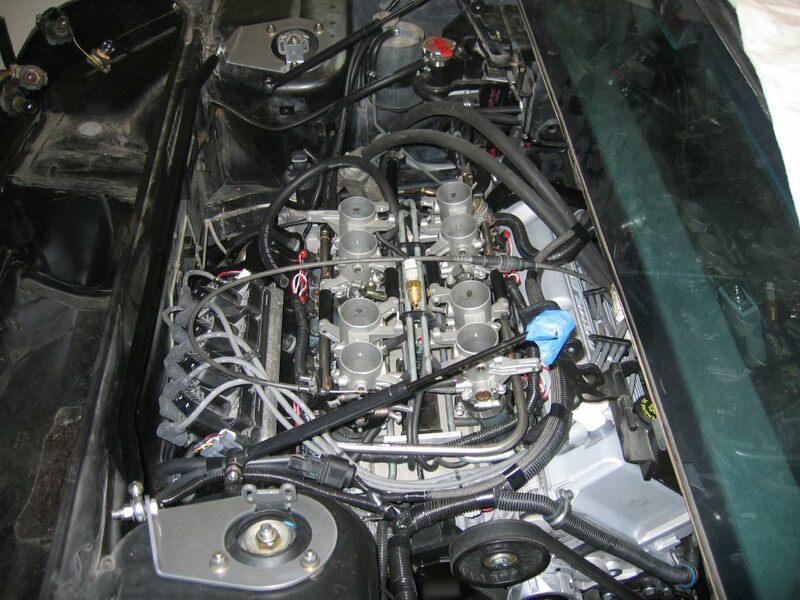 With the help from one of our members, I was able to get a smokin deal on a brand new S1 Aurora engine complete with intake system including injectors plus a brand new PS pump. Might make it easier to install PS later in life when more money is on hand. 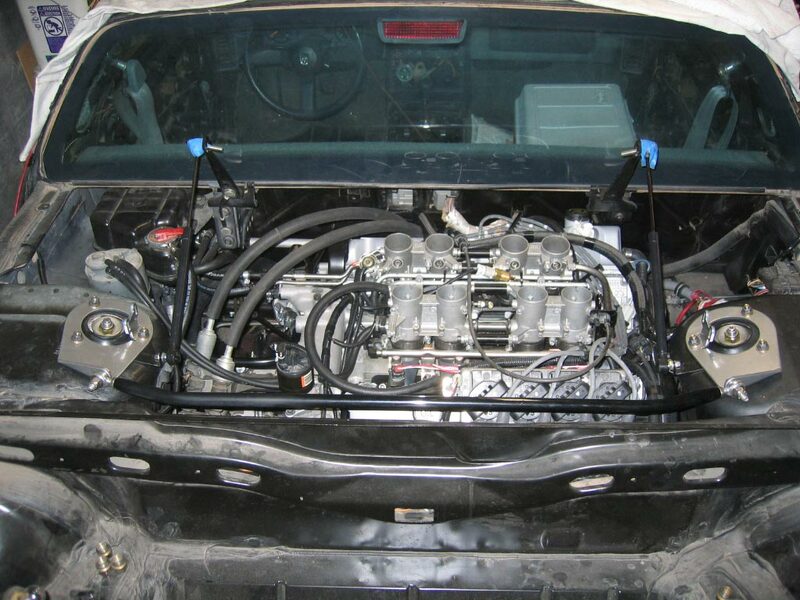 More of these engines are available, BMTFIERO should be posting in the Mall soon with the info. Here are a couple of pictures just after I removed the engine from the crate. It needs to be cleaned still... These are the ones rated at 290 torque and 320hp. From what I can tell, most if not all the extra power is achieved by changing the cams and reving it higher. Edit: After reading several different reviews and articles, it appears that the 290 torque is at 5000rpm and the 320hp is at 6500rpm. 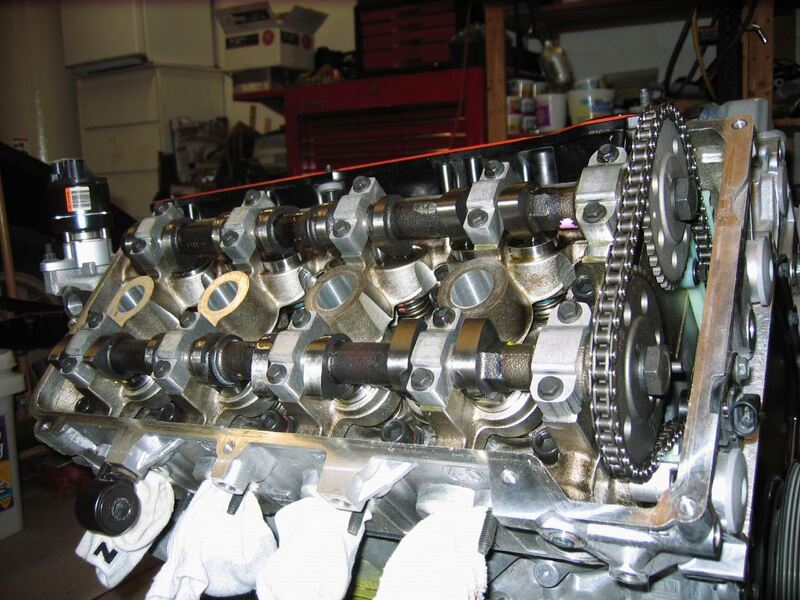 I am seriously considering adding the stronger valve springs from chrfab.com to allow the engine to rev higher than 6500rpm. Window relay wiring cleaned up and ready for switches! The relays are mounted on industrial strength adhesive backed Velcro. ASAP! Lol, I want to hear that sound too... I will be using the stock intake to get it running with the Shelby version of the engine so I can get it through emissions easier. Then if all that goes well, I will save that tuning file and try Russ's ITB setup again. If I get that going as well or better than the stock intake then all that will be left is to see if it will make it through emissions the next time around. What ECM are you going to use with the ITB setup to try to pass emissions? 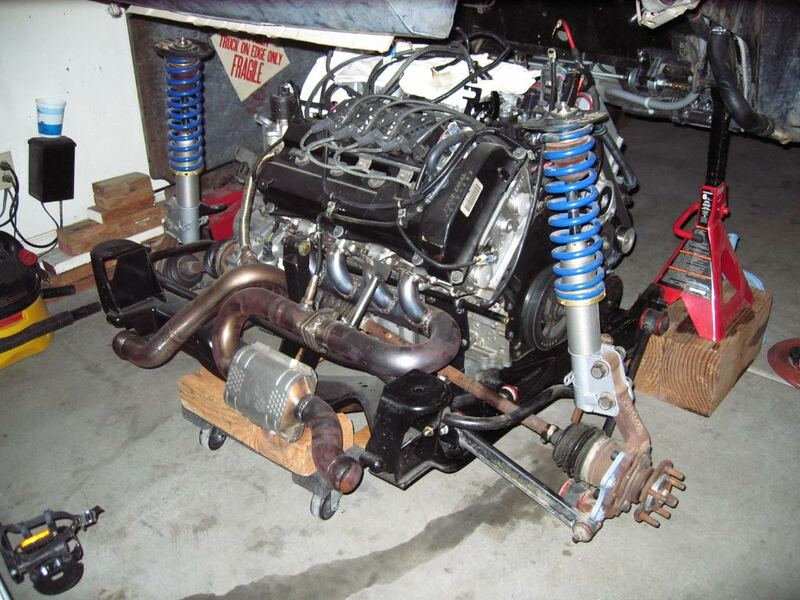 I am going to try the Holley 950 for both intakes. There is a program out that helps with the tuning, I think it is call the co-pilot or something like that. It can watch the wideband O2 sensor and replace the values in your base map while you drive or you can go out and record some driving on your data logger and have the program put the correct values in your base map based on the correction amount the Holley 950 needed to use. There have been some mixed reviews but if you end up being one of the lucky ones, you get a well tuned base map in a fairly short amount of time. Then we will have to see if it is good enough for the emissions test. So, they wont care if its an aftermarket ECM just as long as emissions are within stock paremeters of a N* ? I don't think they will ask much about it since it is an 88, they will look for any smog equipment normally on an 88. ie: vapor canister, pcv system, egr system and catalytic converter. If they don't like what they see then they will send me to a referee that will make the decision for the county on whether or not it complies with the applicable laws. Hopefully It will do ok. I run a Holley analog injection system (Holley Pro-Jection) in my 81 chevy with the controller box sitting on the trans hump. They have never asked me about it. I managed to get the "new" dash installed (old one but no cracks yet) and the gauge cluster with 120 speedo and modified tach. It looks a lot better than it did for a stock interior. Paulv sold me a GT steering wheel so that should come close to completing the coupe to GT look inside. When I get a chance, I will run the engine again to see if the tach is close enough to use. Temp gauge is off. It indicates 100 when the engine temp is 200. I already did the "lamp test fix" so I need to pull the needle and reset it. The modified tach is reading about 300 rpm high. I will need to adjust the trim pot to get it more accurate. I plan on swapping out the bad engine for the Shelby engine starting tomorrow. I will hold off doing any mods to the Shelby engine until after I run it for awhile. For now I will be using the stock intake until it passes emissions then I may try Russ544's ITB again. So your not using any muffler and just using a cat on each bank? So, how loud is it? I've got a 80 series flowmaster on my N* and thought it was a bit loud. I think I'm going to find some short muffler tips. 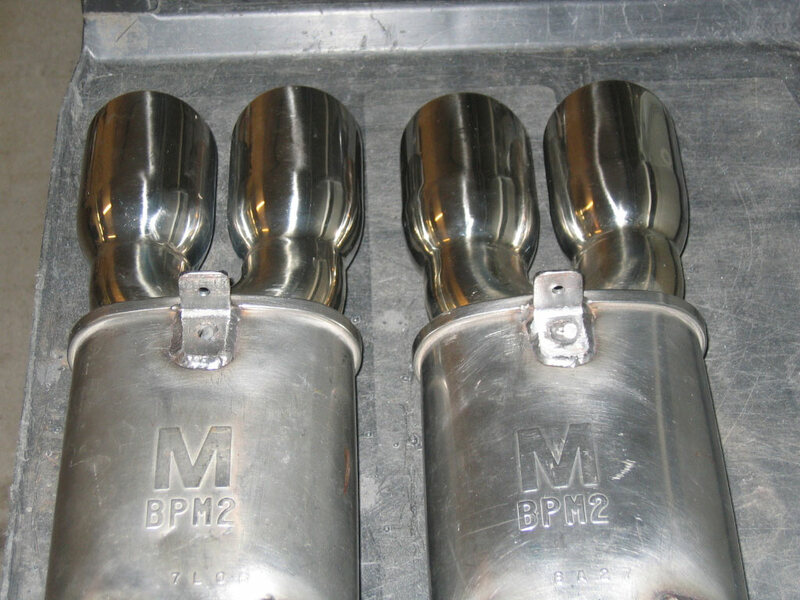 Here are the pictures of my baby mufflers. On the outside of the car it is not too bad at idle and small throttle blips but I will not really know how bad it is until I get a chance to drive it around a little. 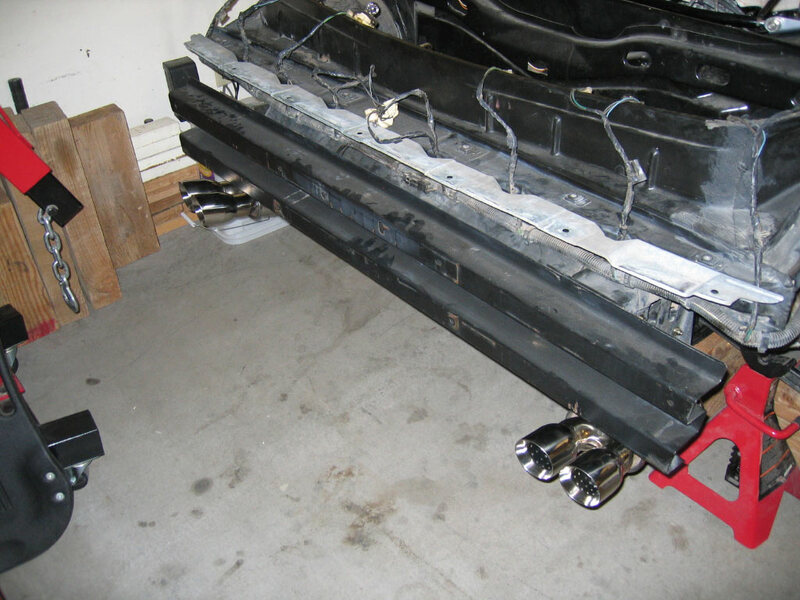 I also have a set of C-6 Corvette resonator tips that I will put on if I they will fit under the rear bumper. I am afraid that there may not be quite enough room to add them. The cams are different between the engines but not so much that it is very obvious. I am curious about the specs on the S1 cams. Tried to set the 99 L47 in the cradle tonight and found one of the bosses has been beefed up so I will need to redo the mount bracket before it will sit in the cradle correctly. Doohhh!! A small price to pay for a newer block. 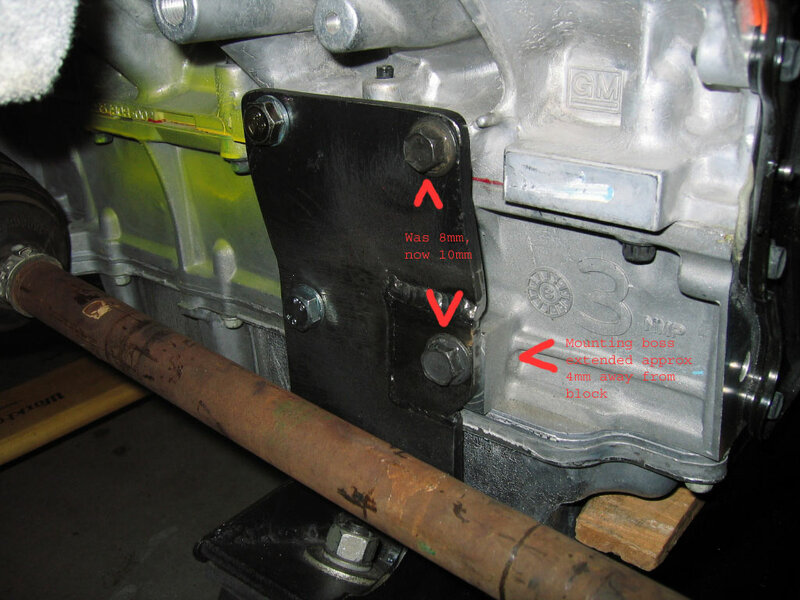 GM increased the bolt size from 8mm to 10mm and increased the lower right mounting boss by extending it out from the block an extra 4mm or so. A little cutting and welding and all is ok with the world again. Couple more pics, then off to bed. Engine is back in the car, just need to add coolant and hookup the + side of the battery. Man that engine sure look purddy. I'm waiting on one thing then I can start my thread. I seriously doubt I could have gone to bed if I was that close. My truck needs an upgrade but since it gets used so little I am putting it low on the list. I helped on a Ford once, just the usual bloody knuckles and soreness afterward. I kinda lied about only needing to put in coolant and hook up the + cable. There was the baby mufflers to put back on and I needed to clean up the install a tad too. The angle iron was cut and ground to improve the appearance and also get rid of the extra weight that was not doing anything. Then the stubby pipe was cut off the baby mufflers and some cut-down C-6 corvette resonator tips where welded on. (horrible weld job with the bad angles) I still need to install the ebrake cables and see how close I came with the brackets. These C-6 tips look Bad Azzz to me! I have those exact same tips I am using for my N*! What mufflers are those? EDIT: Disregard my previous rambling. 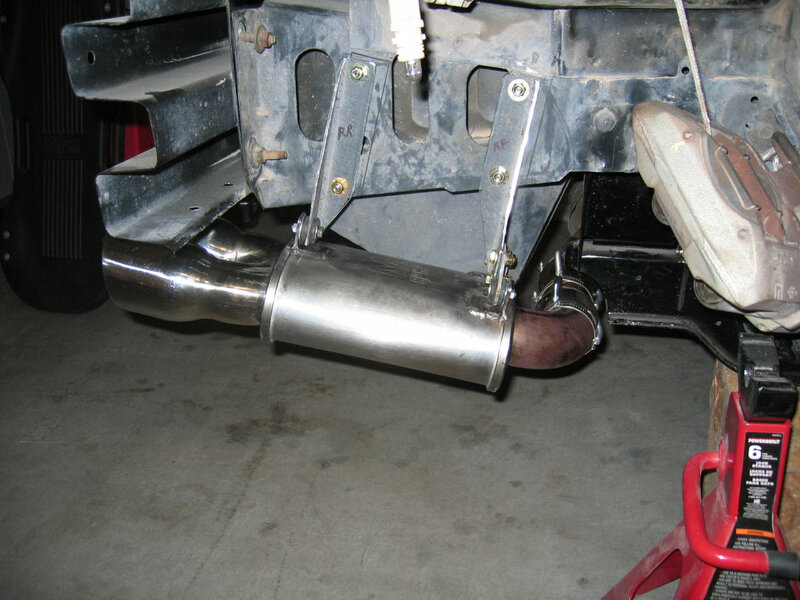 I did a search and found that the Mazda MX-5 (not sure what year) has these exact mufflers. 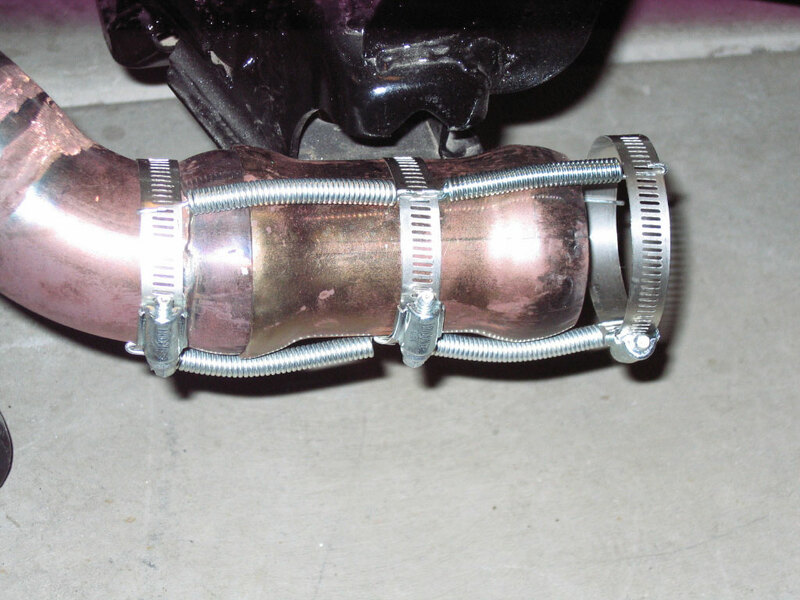 They are the primary muffler of a two muffler system from what I can tell. Look at item number 9.2. Here is a link to the .PDF file that has the info near the top of the page along with pictures near the bottom of the page. I was given these as used for $10 each. The're really just straight perforated pipe with glass packing around them. Better than nothing though. I got a 10 minute video uploading to YouTube.com of the first start of this engine. It idles better than the first one and after it kicked out all the oil (in the form of smoke) in the left exhaust from the old engine, it seems to be running awesome with no smoke. I hope it continues to do this well. Now I will really have to work on getting this thing roadworthy. That what I am talking about that Sounds GRRRRREAT!!! I hope mine sound that good please, please, please, please!!!!!! I took the instrument cluster off and fixed the temp gauge and tachometer. Now that I got it all assembled again I can see what kind of trick it will be to get the ebrake cables routed and connected. 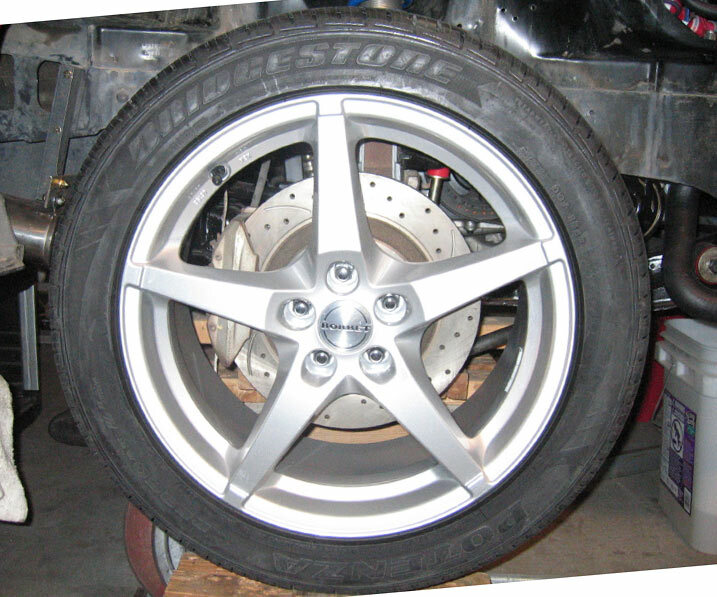 Just curious what would be a good set of brake pads for the stock 88 calipers with the 12" corvette rotor upgrade. The rotors are slotted and drilled but I doubt that would change which brake pads you would use. I do not intend to do a lot of spirited driving with this car so the pads do not need to be super high performance.
. . . I do not intend to do a lot of spirited driving with this car so the pads do not need to be super high performance. Well, I don't want to blow the trans out for at least a week or two! I am trying to figure out where I can pick up a 7" extension of steel wire to connect the parking brake cables together. I will have to start calling around tomorrow and see if anyone can help with that.